Back braces are devices used to help relieve back pain and promote healthier posture patterns. This guide features; why to use a back brace, types of back braces, and reviews the best back braces of 2019 – based on my personal experience and customer reviews. If you have postural problems or back pain that adversely affects your quality of life, it is advisable to use a back brace. If you want to prevent back pain and postural problems, a back brace is a great preventative measure. Back braces are designed to keep your spine properly aligned. Before you choose a back brace for your needs, it is recommended that you consult with your doctor or related medical professional. Once you know more about your needs for a back brace, you may choose from one of the four essential types. The corset brace is designed to promote good posture around the lower and middle back. This type of brace is often used for people with a spinal fusion to help restrict motion that could cause problems and to help with posture. If you suffer from stability issues, the extra support that a rigid back brace provides will benefit you. These braces are ideal for after back surgery or injury to help retrain your muscles used for proper posture, which aids stability. Rigid back braces are not comfortable and are also heavy and bulky. The occupational back brace is designed to prevent back injuries due to poor posture when you are lifting heavy things or performing strenuous activities. Stability around the hip area and the sacroiliac joint are reasons to use a sacroiliac belt. It helps stabilize the area of the lower back where the sacrum and pelvis meet. This brace aids with posture and relieves pain. I’ve curated this list based on my own personal experience with back braces, user reviews, and market research. The Mueller Lumbar Support Back Brace is at the top of this list because it is the most popular back brace available on the market. The 40% polyester, 27% rubber, and 33% nylon construction make it easy to wear and comfortable. It is available in two sizes (28-50” and 50-70” waist sizes). It can easily be custom fitted using the dual, outer elastic tension straps. The steel frame supports the spine for stability. It has a double-layer design to allow for adjustable compression. It is made from molded plastic on the inside to maintain brace rigidity and firmness. For maximum support and for those who have suffered with a sprain, strain, or muscle spasms, the Mueller 255 Lumbar Support Back Brace is a perfect fit. The BraceUP Stabilizing Lumbar Support Belt is almost as popular as the Mueller, but is somewhat slimmer and easier to wear. It is available in three sizes (S/M- 28-35”, L/XL- 35-43”, and XXL- 43-53”). It allows full range of movement and is comfortable. The mesh panels make it breathable. It has a design that minimizes bunching and slipping. There are two adjustable straps for customizing the fit and for compression. It is designed to support your lower back region without restricting your movement and the curvier design reduces slipping or bunching. You get a 100% money back guarantee from the manufacturer within one month of purchasing, which sweetens the deal on the BraceUP Stabilizing Lumbar Support Belt. The Flexguard Support Back Brace is a fully adjustable support brace for lumbar support, posture support, and lower/upper back pain. It has a comfortable, yet durable design. Its design gently pulls your shoulders back into a natural position to help straighten your back. It promotes good posture and helps to train your back. If you’re looking for the best back brace for posture; then this kit is ideal for helping to correct that. Since this posture corrector is a complete brace, it may be a little less comfortable than standard braces, but that is what makes it effective for posture correction. Not only is the Back Brace Posture Corrector built to promote healthy posture, but it also comes with a posture guide that will help you use specific movements to train your back for improved posture. If you suffer from degenerative disc disease, slipped discs, sciatica, or scoliosis, the AidBrace Back Brace Support Belt is designed to relieve low back pain due to these conditions as well as others. It has a mesh backing that is breathable. You can remove the cushioned lumbar pad. It is easy and comfortable to wear. You can adjust the side tension straps. You can enjoy comfort and effective support that will alleviate low back pain using this support belt. The AidBrace Back Brace Support Belt is designed to stretch when you are putting it on. If it does not stretch when you are putting it on, it is too small for you, according to the manufacturer. One of the main reasons the ComfyMed CM-102M Premium Back Brace is so popular is because of its comfort factor. It is built to be durable to last. It has a removable lumbar padding. You get a 12-month warranty. It has easy-grip handles to make adjusting the brace. This back brace is designed to relieve pain that is caused by degenerative disc disease, sprains and strains, slipped discs, scoliosis, muscle spasms, sciatica, and nerve injuries. You can wear it during most daily activities without restricting your natural movement. The 12-month warranty allows you to send back the ComfyMed CM-102M Premium Back Brace if you don’t like it or if something goes awry with the brace. The TORS-GROUP Comfort Posture Corrector is a full back brace that is ideal for correcting problems with posture. It comes in four different sizes (XS, S, XL, and XXL). It has a comfortable 100% cotton liner. It is easy to put on and take off by yourself. It has adjustable shoulder and waist straps. Its ergonomic design is ideal for correcting posture. This posture correcting back brace is suitable for adults and children. It is also medically approved for winged scapula, lordosis, kyphosis, and kyphoscoliosis. It is used for corrective rehabilitation post injury and surgery. The recommendation for using the TOROS-GROUP Comfort Posture Corrector is to use it three to four hours per day, by gradually working your way up through 15-20 minute sessions of wearing it. Your back and shoulders will need to acclimate to wearing this and correcting the posture. Adjustable suspenders and a front Velcro closure are two features that make the Trademark Supplies Back Brace Lumbar Support brace appealing. It is easy to tighten, remove, and wear since it has a Velcro closure. It has four rubber gripper strips to maintain brace stability. The back area is made from breathable spandex. 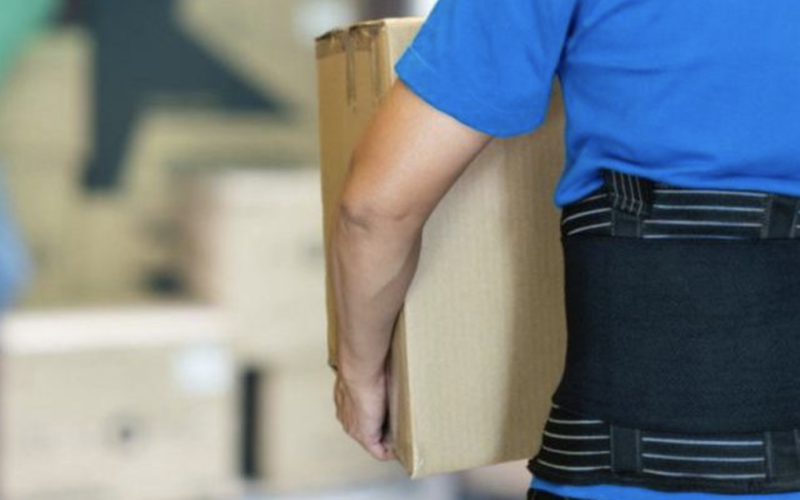 If you work in a job where you perform a lot of heavy lifting, the Trademark Supplies Back Brace Lumbar Support brace is an ideal solution to help prevent injuries. The Holisouse Stabilizing Lower Back Brace is perfect for lumbar support and for back pain relief. It is constructed of polyester mesh to be breathable. It is comfortable and soft for wear. It has three advanced memory alloys that reduce stress on your waist. Dual adjustment straps help to customize your fit. This back brace has several positive reviews and is an affordable solution to reduce low back pain. If you need a back brace you can wear for all your activities, this Holisouse Stabilizing Lower Back Brace is compact, lightweight, and ideal for effective back support. Choosing a back brace for your specific needs starts with consulting with your doctor, physical therapist, chiropractor, or another related medical professional to be sure you find one that meets your needs. It is wise to know as much as possible about back braces, so you can choose the perfect one for you. Whether you need spinal support for heavy lifting, postural support, and correction, or back pain relief, a quality back brace or belt will work wonders for you. Your posture is crucial to your spinal health as well as your overall health and quality of life. Making sure to get the right back brace is that important. Can you recommend a back brace that has a ice pack with it? I recently suffered a back injury and I need to ice my back several times per day. I am looking for a brace that will allow me to ice while I am wearing it. Thanks for all of this great information!